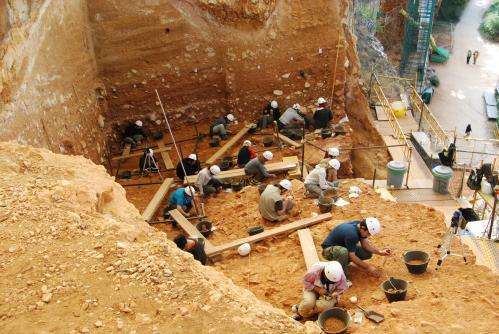 One of the issues of the Atapuerca sites that generates the most scientific debate is the dating of the strata where the fossils are found. Therefore, researchers at the Spanish National Research Centre for Human Evolution, among others, strive to settle the dates. A study published by the 'Journal of Archaeological Science' has clarified that the sediment of Gran Dolina, where the first remains of Homo antecessor were discovered in 1994, is 900,000 years old. The findings at the Lower Palaeolithic cave site of Gran Dolina, in the Sierra de Atapuerca mountain range (Burgos), have led to major advancements in our knowledge of human evolution and occupation of Eurasia. In 1995, specifically, the discovery of the first hominid remains in a stratum of land named TD6, which dated from more than 780,000 years back, was made public in the journal 'Nature'. This was the Homo antecessor, the oldest known hominid species in Europe. As the dating of this and other archaeological sites is the subject of scientific debate – in 2012, a British newspaper questioned Juan Luis Arsuaga, co-director of the sites, and accused him of "distorting our picture of human evolution" -, the researchers are working to date them more precisely. As Josep M. Parés, from the Spanish National Research Centre for Human Evolution, who is leading this study on the new dating of level TD6 of the Gran Dolina, tells SINC: "We are applying new methods and techniques, and we also have better field and laboratory knowledge. We have published a study that represents a small step towards a large project which will take us longer: reviewing all the dates in order to refine them. We want to include it all within a more solid geochronological framework." What this study strictly contributes is the combination of the technique of palaeomagnetism – which entails revising the polarity of the materials constituting stratigraphic layers – with assessing existing dating figures. "On the one hand we employ paramagnetic resonance, and on the other what is known as optically stimulated luminescence. This provides numerical dates, absolute ages. We have reviewed these and combined them with the new figures from palaeomagnetism in order to expand upon the chronology of this level TD6 of the Gran Dolina and the fossils it contains." They were previously given a minimum age of 780,000 years and now it is known that they are referring more accurately to around 900,000 years. "The change might sound very small or very large," the expert continues, "but the TD6 stratum is known precisely as having been the place of discovery of the Homo antecessor and this further defines its age." Since then, a further 90 human fossils and over 200 fragments of carved stone have also been discovered. The extent of the excavation grows ever larger and being able to date it is of great interest to the scientists. "The site has produced thousands of fossils and artifacts and has become a Pleistocene landmark in studies on early human settlement outside the African continent," the article explains. Now, they are going to attempt to use individual fossils, especially teeth, and obtain direct dates for the remains found, as well as those already known by their sediments. "When we handle these figures there are always error margins. For example, when we publish the dating figures for the Sima del Elefante, we are talking about 1.2 million years and the error margin is around 130,000 years. It seems like a huge amount, but it is actually only a small percentage, which can reach 10% of the chronology," Parés concludes. More information: J.M. Parés, L. Arnold, M. Duval, M. Demuro, A. Pérez-González, J.M. Bermúdez de Castro, E. Carbonell, J.L. Arsuaga. "Reassessing the age of Atapuerca-TD6 (Spain): new paleomagnetic results" Journal of Archaeological Science 40: 4586 - 4595, 2013.